Shallots are from the onion family and to me taste like a cross between mild garlic and onion. Their mild enough that they can be used raw, minced in salad dressings. I particularly like them, as they fill a gap in my cooking staples. I typically find 50-lb sacks of onions on sale in late August or early September. My shallots begin maturing in mid to late July. So, with the shallots, I can have something onion-y for that 5 to 6 week period in summer, when I am often all out of purchased onions. I've been digging these 1 or 2 clumps at a time, to add to recipes. My shallots give me a 5 or 6 fold increase. For every 1 shallot I plant, I get 5 or 6 in return. I planted these in early spring this year. Previously, I had planted them in October, per the instructions I was originally given with my initial purchase of the shallot bulbs. But this past fall was a difficult one for me, and many things I might do in "normal" years was put off. So, I didn't plant these until early in March. And as it turns out, these shallots seemed to gain in size better than fall-planted ones. I'll give it a shot again next year, and see if my results are the same. These shallots are descendants from my initial purchase 19 years ago. 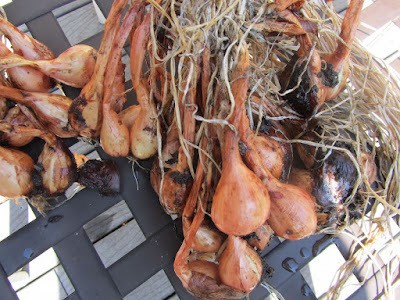 I bought 1 dozen shallot bulbs, planted them out, and saved a few more each year. This spring, I planted 36 shallots. I estimate I will dig a total of about 180 to 200 shallots from this planting. I will save about 40-45 from this year's harvest, and plant in early spring. I will lose a couple over winter, so 40-45 should give me roughly what I had this past year. Oh, and I found that shallots keep well in a paper bag in the fridge, over winter. I was using up the last of the shallots from last summer, in late spring this year. I had forgotten that bag was in the fridge, and was happy to find it when I ran out of purchased onions. I've only begun digging them. I could just dig them all at once, but I was just out in the garden, gathering some veggies for dinner and quickly dug an extra few bunches. I'll dig the remaining shallots over the course of the next week or two. My garlic is also almost ready to dig. Garlic is so cheap in the store, that the only reason I plant it every year is that one year, I had several purchased cloves of garlic that sprouted over winter, so I planted them out. And lo and behold, they grew into garlic bulbs. I've continued on for about 16 years with descendants from those first few cloves of garlic. These do not size up as well as the garlic I find at the produce stand, but for something that's free, I'm happy to do it, and have slightly smaller heads of garlic. I haven't dug any this year, so who knows, maybe these will also have sized up better than usual. That's so cool that you've been able to plant all these years with descendants of the first planting! I have not tried shallots yet, and have had mixed success with garlic. But I keep trying. I was reading a while back that most grocery store garlic comes from China, so I'd like to avoid that by purchasing my own. Seed garlic seems expensive, so I ordered a pound of organic eating garlic from Azure Standard and have saved some in the fridge for planting this fall. So, interesting that you've had mixed success with growing garlic. I should probably look into what garlic requires, and amend my soil accordingly, or choose a better location. I'm waiting to dig the garlic in my garden and see if it did any better than in previous years. Good luck with the garlic you've saved for planting. I hope it grows very well for you! We enjoy the shallots, both for their flavor and as an onion substitute to use when I'm waiting for sacks of onions to go on sale. And it's nice to not need to buy more each year. Maybe you'll have the same success with your garlic! If it were me I'd plant some shallots this fall and the rest in the spring and do a side-by-side comparison to see what gives the best results. I too have had mixed results with garlic trying different locations to try to find where their Happy Place is. I'm going to see if the library has the book Cat suggested. Cat, I will look into that book (see if my library has it). I know I need to amend the soil with more compost. I've pretty much exhausted our soil the past couple of years. Hoping your garlic does well as a result of your work! Now that would be the sensible thing to do. I don't always see the sensible thing!! I'll try that, and grow them in roughly the same location, but a fall planting and spring one, to see if there's a difference. And if there's no difference, then I'll just plant them when it's convenient for me. We're not big onion or garlic eaters, so I never plant them. However, I always like to hear about things that have been grown from last year's seeds/bulbs. Just the way our grandparents did it. yes, I remember you mentioning that Ward is not an onion lover at all. It's fun to perpetuate our plants this way. I do this with potatoes, as well. I just love this...how neat that you've been able to keep this going for so many years! Unless I forget and somehow manage to use all the shallots in cooking some year, I could just keep doing this for as long as I garden. When my kids have their own houses I'll have to make sure to give them some to start with, as well. That'll be my hedge against old-age forgetfulness, and me possibly using all my shallots without setting any aside to replant.